NEW YORK, NY--(Marketwired - Dec 3, 2013) - Fashion gurus have made white an acceptable color even in the dead of winter. When the temperature drops, wine aficionados believe the same. There is no reason to banish white wines to only summertime enjoyment. 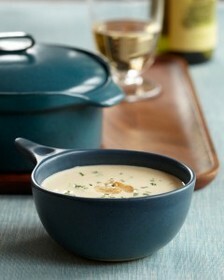 Instead, seek out whites with more structure and weight to accompany winter's heartier fare. White wines from Italy's most northerly region of Alto Adige -- also known as Südtirol -- are a go-to choice. Thanks to high elevation vineyards, low yields and a long ripening season, the white wines from here are blessed with both striking acidity and richness in the mouth. Quality is guaranteed, too, as in this tiny region (one third the size of Napa Valley!) 99% of all wines carry a DOC designation. If you don't have a bottle of Pinot Bianco on hand for this recipe, Gewürztraminer from the region works perfectly as well. Gewürztraminer is indigenous to Alto Adige, originating back in the 13th century from the town of Traminer (meaning "spice"). Today it is one of the region's most popular wines. Its spectrum of exotic scents, including rose petals, lychees, cloves and tropical fruits, makes it the iconic example of an aromatic grape variety. Generally drier than its Alsatian counterpart, this multi-faceted wine is perfect on its own or paired with a range of different flavors. Try with ham or pork-based dishes, smoked salmon, blue-veined cheeses, as well as Asian and Thai dishes or other spicy foods such as curries. When the cold weather hits, don't just reach for red wines. Elegant and complex winter whites from Alto Adige are stylish choices for sipping year-round. For more information visit www.altoadigewinesusa.com or find us on Facebook at www.facebook.com/AAwines. The objectives of the PROVINUS campaign, co-financed by the Italian State and the European Union, are to increase overall awareness of the DOC wines from Alto Adige, demonstrate their versatility with a wide range of foods, and showcase the diverse palette of wines that emanate from such a unique winegrowing region.